This project can be modified to produce several other similar pieces. 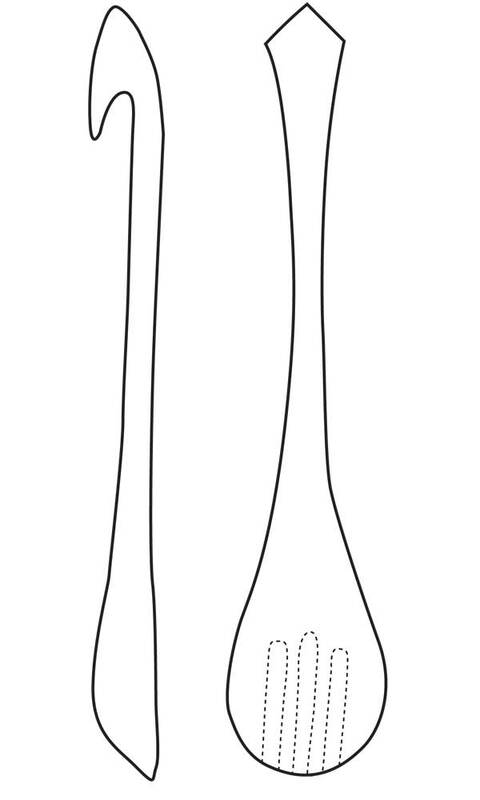 We will start with a simple spoon and then look at how this design can be used as a basic shape from which a pair of salad servers or a kitchen spatula can be made. You could also personalise any of these with added carved decoration. 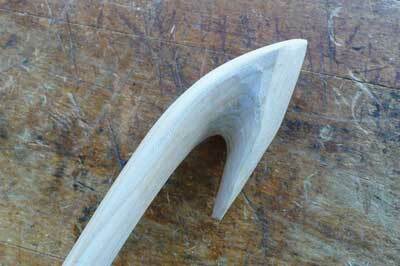 Iâ€™ll start by carving a simple spoon shape to get the idea of the process and then will elaborate on it. The timber must be quite hard and it must be non-toxic. A surprising number of timbers are not recommended for culinary or general kitchen use as they can have unhealthy consequences. Also the dust from many of these is actually very harmful so should be avoided. In general you will be alright with lime (Tilia vulgaris), sycamore (Acer pseudoplatanus), beech (Fagus sylvatica) and the fruitwoods - apple (Malus sylvestris), pear (Pyrus communis), cherry (Prunus spp.) etc. The wood doesn't even need to be dry - it can be cut from green logs if necessary and often it is better to carve it this way. Sketch out a rough shape, draw a centreline along its full length, then carefully draw half of your design and cut it out from a piece of card. 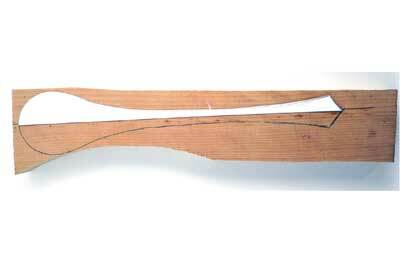 Transfer this pattern onto your block of wood, fold it over - keeping the centreline in the same place - and draw the other side to give the whole symmetrical outline of the spoon. 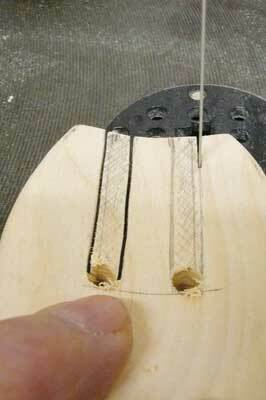 Using your bandsaw or coping saw, cut round the outline, keeping as close to the line as you can to maintain the symmetry. 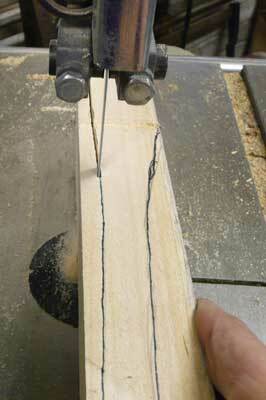 Use the waste material to make a jig in which to hold the spoon while you carve it. There are many other ways that you can stop the spoon from moving but this is probably the easiest. 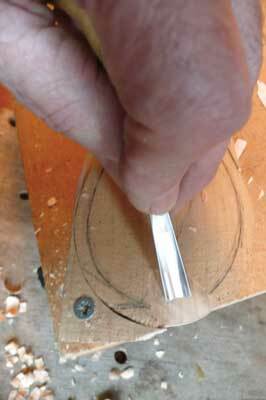 Carve out the bowl hollow first, using a 12mm gouge with a fairly deep sweep, say a 5, 6 or 7. 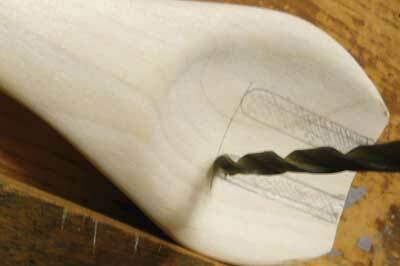 Carving the bowl first keeps the block flat on the supporting board. 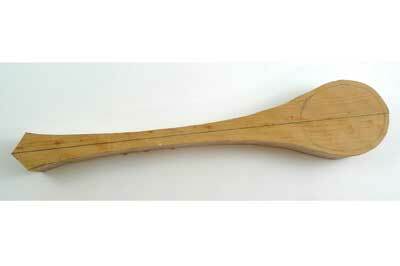 If you carve the back first this is not the case and you could have problems. 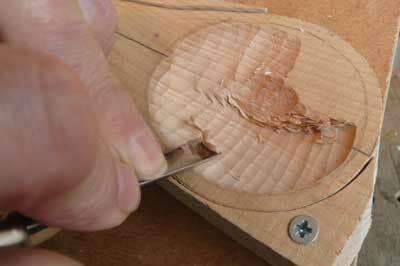 Work across the direction of the grain to avoid splitting out and undercutting what you have already carved. 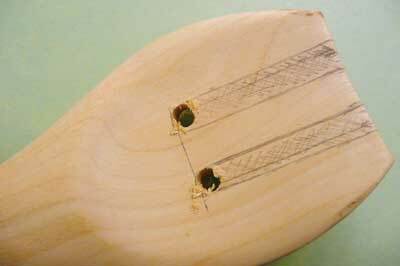 With any hollow shapes or difficult grain patterns, it is always better to work across the grain. 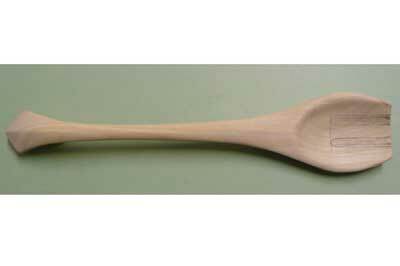 Don't try to carve too deeply on this first spoon; it is not really necessary and can only cause problems. 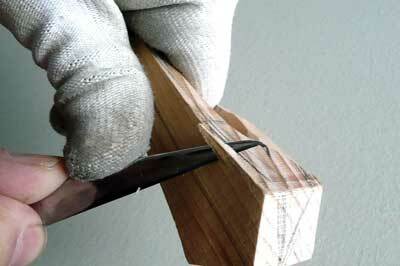 When using a coping saw, the blade needs to be fitted so that the teeth point towards the handle. 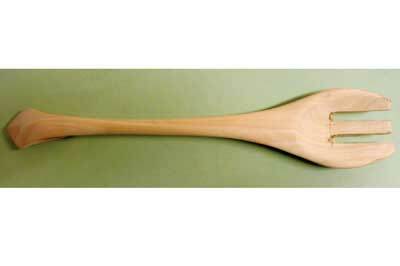 This means that the cutting stroke is a pull stroke either towards you if the spoon is vertical, or downwards if the spoon is held flat. If the blade is pointing the other way there is a danger of it springing out of the saw because you will be cutting with a push stroke. 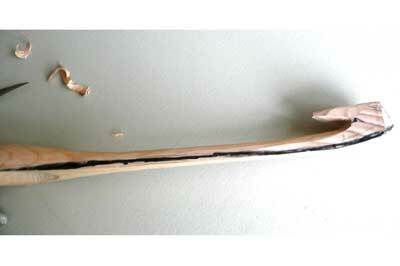 Next, draw the line of the spoon handle onto the underneath in a flowing shape, then saw off the waste from underneath. 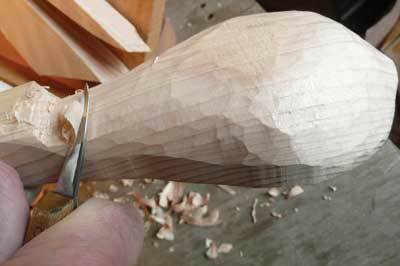 Once happy with the line, shape the underside of the handle. Now shape the hook end. 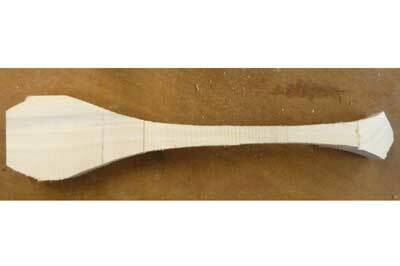 When the desired lines are achieved mark in the top profile, shape this with your knife and then sand and refine the surface as necessary. 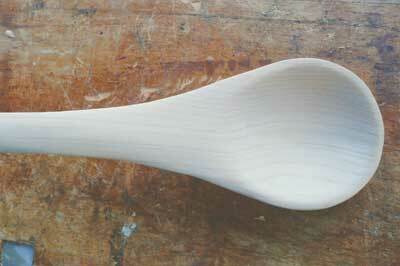 The finished spoon sanded and treated with three coats of olive oil. 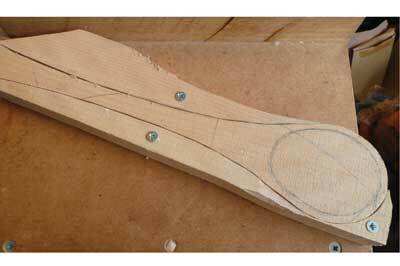 This time cut out the front and side views from a square-edged piece of wood. 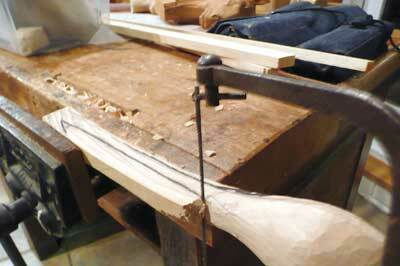 Leave a short length of each side uncut so the waste remains attached until all the cutting is complete. 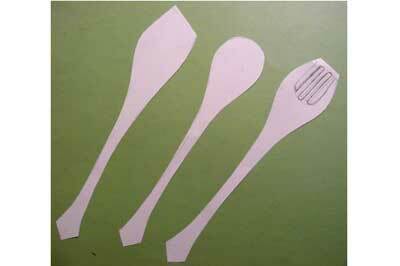 The salad server cut out and end marked. Drill the bottom of the prongs. Holes drilled ready for cutting out. 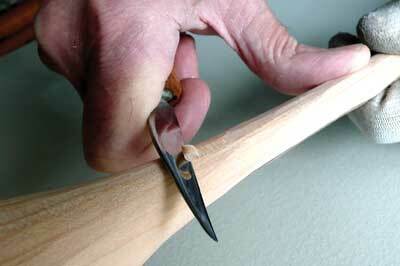 Carefully cut out the waste with your bandsaw or coping saw and trim with a knife, finally sanding smooth. 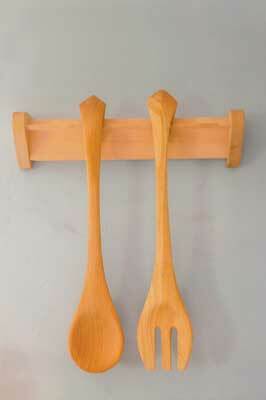 Sand and finish the salad server fork to match the spoon. 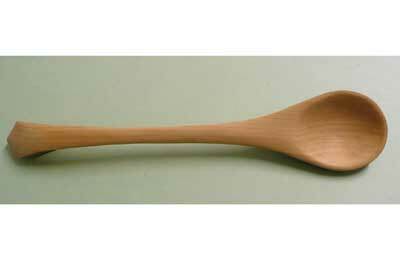 If you wish to carve different patterns to match the original, suitable patterns can be made from the finished spoon. 1. If you intend using a bandsaw to remove the waste you might want to tape the waste that you cut off at the beginning of the project back onto the blank to support it while cutting. This amount of waste, however, could easily be removed with a coping saw. 2. Do not give the servers too many prongs or make them too close together. These measures will ensure strength and avoid food being trapped between them. 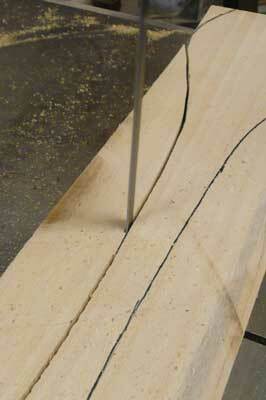 What is more, narrow gaps are much more difficult to clean up and finish smoothly.